SeaWorld's future is looking dimmer. On Friday morning, the company's stock reached $16.21 - its lowest point in more than a year. The bad news comes just days after a video surfaced showing Morgan, a SeaWorld-owned, wild-caught orca on loan to Spain's Loro Parque, beaching herself in an effort to get away from the bullying of other orcas in her tiny tank. Ever since the 2013 release of "Blackfish," the film that brought the marine park's numerous animal welfare issues to the public eye, SeaWorld has been facing an uphill battle. For years, the company has been saying that the "Blackfish" facts were wrong, and, until recently, denied that the film had significantly affected SeaWorld's performance. Reduced attendance at the parks was largely blamed on bad weather or poorly timed holiday weekends - a key traffic source for amusement parks. But its stock chart tells a different story. Before "Blackfish," SeaWorld's stock was hovering just shy of $40 per share. After July 19, the day "Blackfish" was released, the stock took a sharp dive, from which it never recovered. 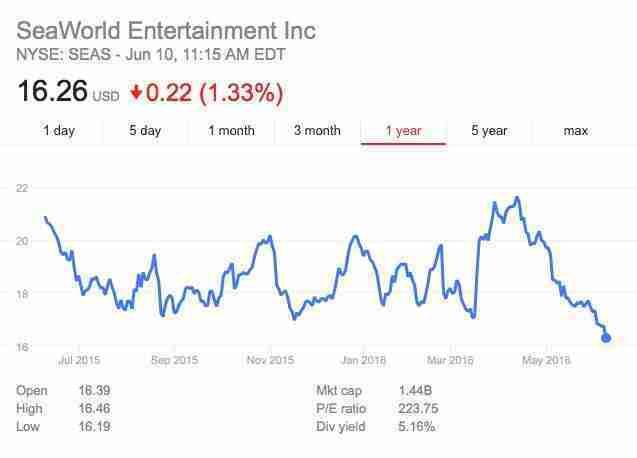 Since August 2014, the stock has rarely gone above $20, a 50 percent drop from the pre-"Blackfish" days. Since then, the stock has acted as a barometer for the company's woes, dropping each time some new revelation about the company's alleged animal mistreatment or internal reorganizing came to light. But even then, Thursday's numbers appear to be the second-lowest stock price in the last five years - the one exception came in December 2014, when SeaWorld's shares hit $15.77 the day after then-CEO Jim Atchison stepped down. SeaWorld attempted to fix the problem in March when it announced an end to all orca breeding, setting the stage for an eventual end to its captive orca program. But the news was tempered by the company's staunch refusal to consider releasing its remaining orcas - who could live decades yet in the company's tiny tanks - to a sea sanctuary. Now it's unclear if good PR can even trump the "Blackfish" effect. This week's stock low comes despite SeaWorld Orlando's Friday opening of its long-awaited Mako roller coaster - the tallest coaster in Orlando, Florida, and a much-touted initiative designed to help flagging attendence and make the park stand out from local competitors like Walt Disney World and Universal Studios. And investors haven't just expressed their disapproval through the stock prices. 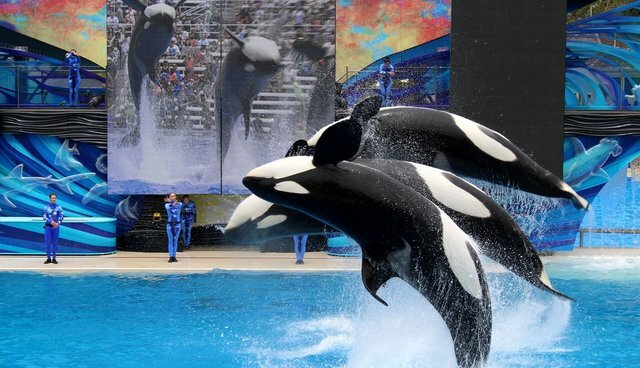 This week, a group of investors reopened a previously dismissed lawsuit against SeaWorld, arguing that the company had misled them by lying about the negative effect "Blackfish" was having on attendance and business performance. Of course, it's good to see SeaWorld finally taking a step in the right direction, however reluctant. But given its recent stock performance, one can't help but wonder if it's too little, too late.